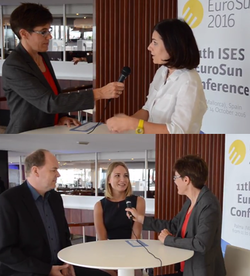 The International Solar Energy Society (ISES) engaged solrico partners to film and edit up to 10 video interviews with specialists during the conference EuroSun 2016 from 11 to 14 October in Palma de Mallorca, Spain. Organised by ISES in cooperation with the University of the Balearic Islands, the conference is attended mainly by scientists and industry stakeholders from the solar heating and cooling sector. But for the first time, speakers also included well-known specialists from the photovoltaics sector. The ten video interviews carried out by solrico and filmed by Eva Augsten, a German freelance journalist specialised in renewable energies, illustrate the wide range of opinions on solar heat and solar electricity market and technology development. You find the playlist here.